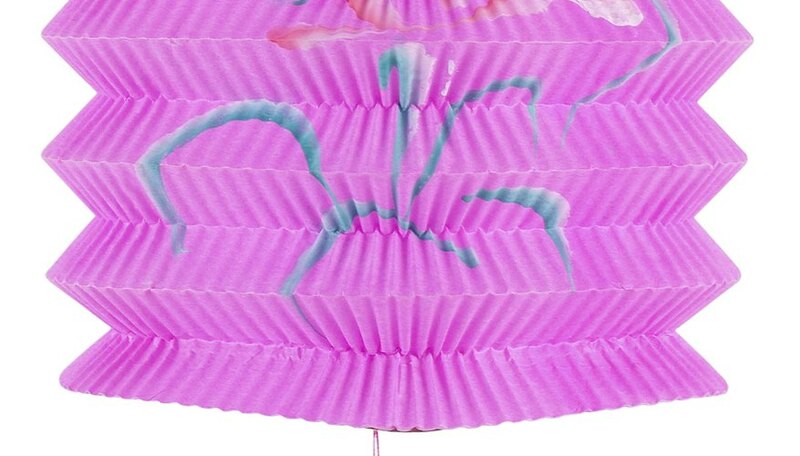 Paper lanterns are decorative pieces that may make an area attractive during functions such as a wedding reception, or a birthday or graduation party. Creating several paper lanterns and hanging them on a string from wall to wall adds decoration to a room. Paper lanterns can be created to hold a battery-operated candle, making them luminaries as well. Fold a rectangular piece of paper so it is in the shape of one long, skinnier rectangular piece. Create multiple cuts along the paper’s crease perpendicular to the long crease. Do not allow the cuts to reach the edge of the paper -- the long side opposite the paper’s crease. Open up the folded paper to see the slits you cut through the center of the paper. Bring the two short sides of the rectangular paper together and attach them using glue. Stand the paper lantern up so the slits you created are vertical. Cut a piece of construction paper or a piece of yarn 1/2 foot long. Keep the construction paper about 1/3 inch wide. Attach one end of the construction paper strip or yarn to one side of the top of the lantern using glue, and glue the other end of the strip or yarn on the opposite side of the top of the paper lantern. Trim two rectangular pieces of paper in half lengthwise to create a paper lantern that bears a unique shape on the side if you'd rather not have slits in the lantern. Draw a desired shape in the center of two of the four rectangular skinny pieces, such as a heart or star. Draw a smaller rectangle within the two skinny rectangles that do not have a shape in their centers, tracing the lines of each rectangle 1/2 inch in from the edge of the big rectangular piece on which you are drawing. Fold along the drawn lines, making the folded areas point in the same direction. Create a square-like piece of paper that is 6.5 inches by 5.5 inches, and draw a tinier square within this piece of paper by tracing the lines of the square 1/2 inch in from the edges of the paper. Fold these flaps up; this square piece is the bottom of the paper lantern. Glue the four rectangular pieces together so they form a rectangular-shaped box, allowing the two pieces bearing a shape in their centers to stand opposite each other. Attach the four pieces to one another and to the bottom square using the folded areas as gluing spots. Place battery-operated candles in the paper lanterns if you want them to glow.